Global climate change is a serious concern for the future of our entire planet. However, the regional impacts of climate change are often overlooked. 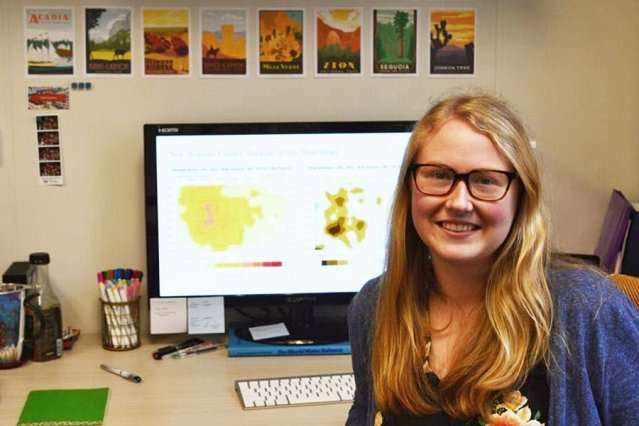 Catherine Nikiel, a Ph.D. student in the Department of Civil and Environmental Engineering, is studying the impact of climate change on different aspects of the hydrological cycle as part of her research in the lab of Breene M. Kerr Professor Elfatih Eltahir. Nikiel studies the impact of land-use change on regional climate in the midwestern United States. In particular, Nikiel examines agricultural changes over the past century, contributing to climate change, such as the expansion of agriculture, increases in productivity, and the expansion of irrigation. Q: What are the real-world implications of your research? A: My Ph.D. work focuses on what climate change will do to humid heat waves and droughts, looking specifically at the Great Plains and the Midwest region. It is important to understand what the impacts are going to be at smaller scales, because that is where the adaptation is going to take place. Understanding how climate change will affect various areas at a regional scale makes it easier to communicate what the effects are going to be for communities. These areas are going to experience more heat waves, the potential of drought is going to increase, and we have to ask what the lasting impact is going to be for a community or even a group of multiple states; or what that means for an economic sector. Droughts and heat waves are extremely damaging for crops; and the Midwest is the corn belt of the United States, which is important because a great deal of corn and soybean is exported both nationally and internationally. It is important to make climate change tangible, and link the potential damages to those impacts. Q: What opportunities have you had to delve deeper into your research? A: Since being at MIT, I have had the chance to explore ways that climate, water, and agriculture all come together in very specific ways. For example, this past spring, Professor Eltahir put together a workshop called "The Future of the Nile Water." There's conflict about the Nile River because it is the only water resource in a dry area, and it is shared between many different countries. There is a lot of interest in how factors such as water, population growth, climate change, and agricultural expansion will influence these countries. The workshop invited journalists, academics, and industry professionals from Egypt, India, and Sudan to talk about the issues that could arise in the future, and some of the factors that are important to bring into the discussion now such as climate change, population growth, and agricultural productivity. The forum discussed these considerations and how to identify how they're interconnected. The goal is to take climate change impacts and make them tangible for a specific issue and region. Prior to the forum, we were each assigned a topic and researched that area for six-weeks, familiarizing ourselves with the region, the history, and the science. The workshop lasted two days, and it was our chance to bring together the knowledge we had collected, and also learn from the attendees of the workshop who are from those regions; who are dealing with those issues, and are the ones who are really familiar with the situation. We learned that it is not just a resource issue—it is a social, political, and economical issue. The forum showed us the importance of having the voices that truly experience these issues first-hand present. I have also had the opportunity to work with climate models, which I have had never used prior to MIT. We hear about the impacts of what climate change is going to do, and it's interesting to see what comes before the IPCC (Intergovernmental panel on climate change) reports, and understand how the models are made, and how to apply them appropriately. Q: What's the next step for you? A: What I ultimately want to do, and what I studied as an undergraduate, is focusing on the impacts of hurricanes. Since moving to MIT, I have been interested in how communities can be more resilient towards natural disasters. Understanding how climate change is going to impact virtually every system is so important in helping communities build resilience. We can't only plan for what is happening now, we need to plan for what might happen in the future. When planning for the future, it is crucial to consider how communities and climate might evolve. When I leave MIT, I want to continue to do something that helps cities, states and countries become more resilient. I am really interested in coastal communities, which I think stems from my initial interest in hurricanes. I spent a lot of time in Houston, a city that deals with water in all of its forms, and I have seen firsthand how natural disasters can affect a city. It is something that's going to have to be dealt with, and something of interest to me. As a response to climate change, mitigation is important, but adaptation is even more important and not something that can be avoided. I see myself doing something more policy focused. I am unsure if that will be in the public sector or industry, I am not tied down to the exact sector, but whatever is going to be most impactful interests me the most.